The most recent contest has concluded. Good luck! Stay tuned to Jan Marini Skin Research on your favorite social media channels for the next giveaway. Want even more chances to win? Share this link with your friends on social media. 3. Must be 18 or older and a United States resident to enter. 4. This drawing promotion is void where prohibited. Written entries must be received by 11:59 P.M. EST, on March 30, 2017. 6. 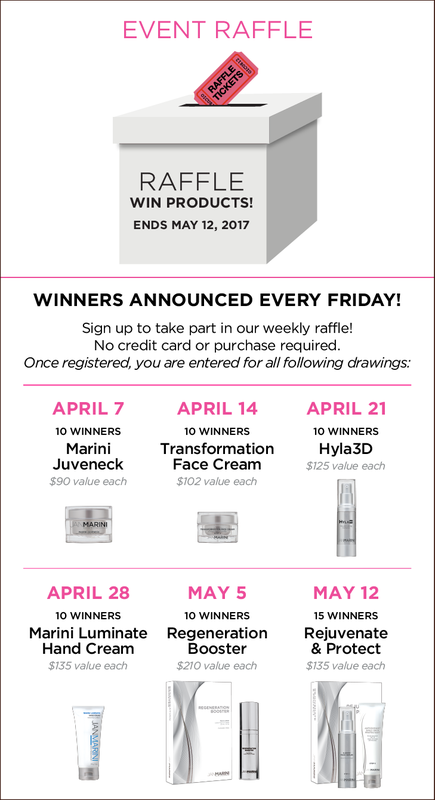 Ten winners will be selected by Jan Marini Skin Research on March 31, 2017. 8. Winners will be notified via email or self-addressed envelope and products will be shipped to winners. 9. Odds based on number of unclaimed prizes and number of eligible entries received. - Deduct the value of the products from JMSR invoices. - Receive a credit toward a future purchase of JMSR products. - Substitute or transfer prizes. - Public relations and promotional agencies of JMSR. - Immediate family members of JMSR and any persons living in the same household as, any such JMSR employee. The term immediate family members is defined as spouses, parents, grandparents, siblings, children, and grandchildren. 12. Entrants grant JMSR the right to use and publish their proper name online and in print, or in any other media, in connection with the Contest. 13. Disqualification of Entries. JMSR may prohibit any entrant from participating in this drawing or any future JMSR promotions if, at the sole discretion of JMSR, such entrant (i) has tampered with the entry process or operation of the drawing or web site, (ii) repeatedly shows disregard for the rules, or (iii) acts (a) in an unsportsmanlike manner, (b) with an intent to annoy, abuse, threaten, or harass JMSR or any other entrant, or (c) in any other disruptive manner. 14. The value of the prize is $170.00. 15. The Drawing may be terminated at any time after its commencement without prior notice; however, any prize due will still be awarded. a. All taxes, fees and surcharges on prizes are the sole responsibility of the winner. b. JMSR is not responsible for any incorrect or inaccurate information, whether caused by web site users or by any of the equipment or programming associated with the Contest or by any technical or human error which may occur in the processing of the entries in the Contest. JMSR assume no responsibility for any error, omission, interruption, deletion, defect, delay in operation or transmission, communications line failure, theft or destruction or authorized access to, or alteration of, entries. c. If, for any reason, the Contest is not capable of running as planned, including infection by computer virus, bugs, tampering, unauthorized intervention, fraud, technical failures, or any other causes beyond the control of JMSR which corrupt administration, security, fairness, integrity, or proper conduct of the Contest, JMSR reserves the right at its sole discretion to cancel, terminate, modify or suspend the Contest. d. JMSR is not responsible for any problems or technical malfunction of any computer online systems, servers or providers, computer equipment, software, failure or email on account of technical problems or traffic congestion on the Internet or at any web site or combination thereof, including injury or damage to participants or to any other persons computer related to or resulting from participating in this Contest. e. By participating in this Contest, each entrant agrees to release and hold JMSR and its respective employees, officers, directors, agents, and representatives, harmless from any and all losses, damages, rights, claims, and actions of any kind including, without limitation, personal injuries, death and property damages, and claims based on publicity rights, defamation, or invasion of privacy, either directly or indirectly related to or arising from the Contest or from acceptance, possession, misuse or use of a product prize. This drawing is governed by the laws of the State of California. Any claims or disputes arising from this drawing shall be presented and resolved only in Santa Clara County, California.